“Calling the company any company is a waste of time. I need information that neither I find on the website or by calling the company. Google is often of little help. Chat has been around since the beginning of computers having used one in the mid-1970s it was great for short one-line conversations like “wanna go for coffee.” We built multi-level chat in the early 90s for LANs allowing users to talk with up to 4 people at the same time which was very popular. By now via smartphone or other means, Twitter is really a form of chat as well as WhatsApp, Facebook Messenger, Slack, Snapchat, SMS, and others form the basis of the major of consumer communications. Companies have been slow as running through sand to incorporate chat into their external business communications. Now we have chatbots integrated with artificial intelligence (AI) which for the most part is still like talking to a young child often as appealing or for many rather annoying. Today, automated chatbots and “live” chat are good for simple tasks such as what are your businesses hours, can I make a reservation, is my flight delayed and so on. 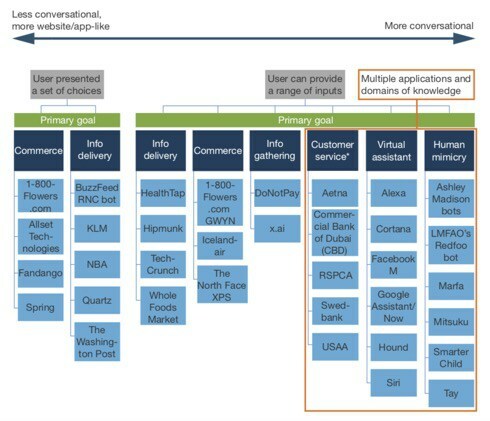 If you analyze user communications, you begin to realize the limitations of chatbots to go beyond “simple” communications. Let’s explore some of the reasons why. Click on either image for indepth white papers on chatbots or Exhibit A (below) for more benefits. Chatbots are important communication tools and before you begin you should ask 1) why are we capturing chatbot conversations, 2) what do we expect these conversations will tell us about what we are asking which leads to 3) will we really understand what they are telling us, 4) what should we do about what they tell us and within that aspect will they tell us what we are looking for not out thinking this communication parlay and 5) will we just spend a lot of time wasted on analysis ending up in some kind of analysis-paralysis. Actually, I found a reference to Thomas J. Watson Senior (1) about customer communication which is also my experience to simply “go see them without any planned survey but just sit down with them and listen, really listen to what they have to say” is more valuable than millions of dollars in surveys designed by people who really don’t understand what customers really want. This means that we should not replace chatbots for real customer communication but it can add an innovative means to provide the way to communicate with customers the ways they want to communicate with you. Chatbots are not a panacea nor a singular solution to business operations but provides a means to add better, more personal and even fun way to connect and engage with customers. – Start now – add a chatbot today and let people know you are “new” and may not have many answers. – Start small – realize chatbots are not a panacea for “live” customer communication but help those who don’t want the pressure of live interactions. king for and add that content in a way that users want it not the way you want to. – Fit into lifestyle – build processes, training and linkages to all departments as users often not just want sales or support but random questions including emerging issues such as discrimination and environment. – Live for life – chatbots like exercise are just one and done. Nothing is worth than a website than hasn’t been updated in year. Chatbots should be updated daily just to show you are really real. If you are ready to take action now, depending on your requirements, we can begin today to help you build and maintain an IBM Assistant Chatbot for your WordPress website by an IBM Watson Developer – email cross@gocross.com to get started. Vertical views – banking, retailing, education, transportation, etc.